Italian sculptor. Born in Tuscany, he went to Naples in 1639 to assist his uncle, Giuliano Finelli, in the execution of a series of 13 statues (1646, Naples Cathedral, chapel of S Januarius) representing the patron saints of Naples. He remained under Finellis tutelage for the next decade, during which time he was involved in the popular revolt led by Masaniello against the Spanish in 1647-8. 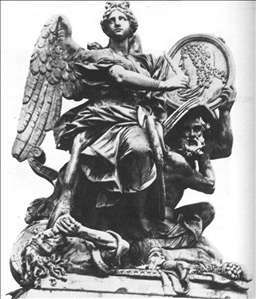 In 1648 he arrived in Rome where he entered the studio of Alessandro Algardi. He remained there until Algardis death in 1654 when he established himself as an independent sculptor. He assisted Algardi on many different projects, including the gigantic marble relief Encounter of Leo the Great and Attila (1646-53, St Peters, Rome). He also collaborated with Ercole Ferrata and Francesco Baratta on the execution, from Algardis design, of the marble high altar (1653-54) of S Nicola da Tolentino in Rome. 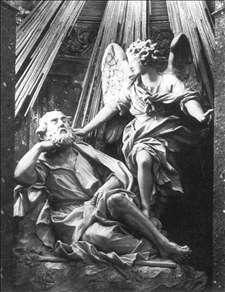 His first major independent commission was for the large marble relief of the Lamentation (1659-76, Chapel of Monte di Pietà, Rome), a work that reveals his debt to Algardi and Finelli. The compactness and cohesiveness recall Algardis Leo and Attila but Guidis figures are crowded together into a single shallow plane with little attempt at spatial illusion. The sharply cut and jagged folds of drapery, characteristic of all his work, emulate Finellis method of carving. See more details about "Fame Reviving the History of Louis XIV"
See more details about "Vision of St Joseph"